At the tail end of 2017, Image Comics recruited me as their new brand manager. Image Comics is the third largest publisher in the American comic book market, and the largest destination for creator-owned sequential art. Comics published by Image include The Walking Dead, Saga, Monstress, Deadly Class, Spawn, and Descender, among dozens of others. My incoming strategy was three-fold: provide more accessible touch points to genre fans unfamiliar with comics, emphasize artists, and venture further into podcasting and video. Here’s a sample of some of the projects I produced. And here’s a look at the photography and portraits I took during this period. My first responsibility was to helm and rethink Image+, an 80-page promotional magazine filled with exclusive comics, comic previews, and Q&As. The magazine was free with any copy of Previews, $1.99 otherwise. We later shifted all of our content online with the ending of the second volume, but editing a print magazine in 2018/2019 was a reminder of how ornate and thoughtful journalism could be when printed and bound. I expanded the format of the magazine with art features, creator editorials, lifestyle features, and trend pieces by feature journalists from The Atlantic, GQ, and The New York Times. My goal was to make a magazine as deep and absorbing as an issue of The Atlantic, Esquire, or Paste—a collection of media dedicated to challenging and entertaining, while still showing the depth of Image’s publishing line. Enough credit can’t be given to Sasha Head, the designer behind Image+. The same goes for Scott Snyder, Jock, Matt Hollingsworth, and Will Dennis—the creative team of Wytches: Bad Egg, the exclusive comic that ran in every issue of Image+ that I edited. As mentioned, we shifted all content online in summer 2018, publishing new pieces including an oral history of the Warren Ellis forums, various art process guides, series playlists, and more in-depth features. As brand manager, I was responsible for hosting daily panels at the biggest comic conventions in the United States, including San Diego Comic-Con, New York Comic Con, Emerald City Con, C2E2, and more. Under my programming, I refined the scope of the conventions—how could panels be accessible to new comic book fans while remaining attractive to die-hard “Wednesday Warriors” and art aficionados? One of my solutions was to offer panels based on genre. Dovetailing with Image’s “We Believe in Comics” marketing campaign, I launched panels including “We Believe in Fantasy,” “We Believe in Sci-Fi,” and, my personal favorite, “We Believe in Horror.” This strategy allowed fans outside of comics to find a compact introduction to our titles, while also offering veteran comic lovers access to creators like Jeff Lemire and Jason Aaron as they dove into their elaborate mythologies. I also instituted panel programming devoted strictly to artists. 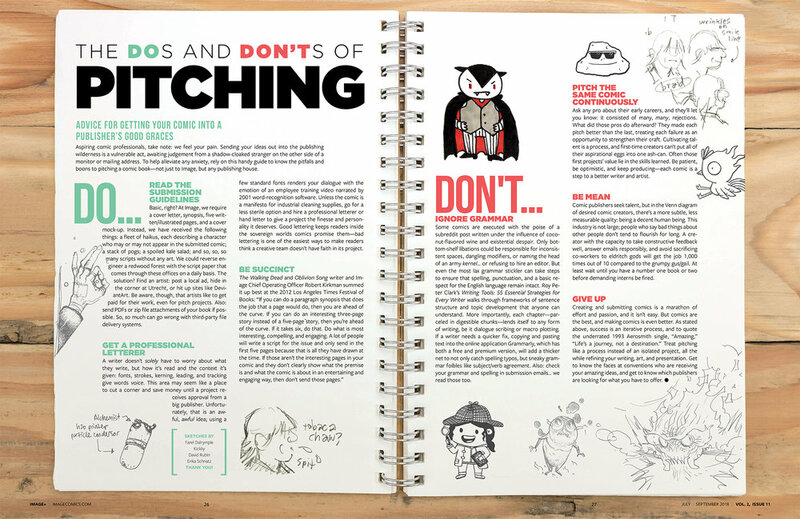 These included panels that targeted specific subjects—character design, process panels that showed that evolution of a comic page from thumbnails to letters—and Live Draw Art Jams. The Art Jams featured three creators taking turns sketching on the same digital canvas (provided through a Wacom MobileStudio Pro), hooked up to an overhead monitor. The audience could see the artists sketch in real time, and I’d discuss art process with the participants who weren’t actively drawing. This format proved the most attractive to more general audiences. At Big Adventure, a concert and comedy showcase in Orange County, crowds accumulated to see artists Nick Dragotta, Justin Greenwood, and Morgan Beem sketch. Other participants included Todd McFarlane, Wes Craig, Ryan Ottley, Mirka Andolfo, Andrew MacLean, Caitlin Yarsky, Megan Hutchison, and Elise McCall. When brainstorming a new podcast at Image, I was initially presented with the idea to interview creators for a continuation of a previous series. It wouldn’t have been the first time I’d done so—I’d hosted a comic interview podcast at Paste with my NPR co-host Eric French, Sequential Heart. The problem was that many, many podcasts follow this format, and I’m not self-important enough to think that I could attract a flood of listeners with my astute questions. I wanted to think broader. In the same line as my Songs Illustrated project, I wanted to attract readers to Image who might not be familiar with, or have even read, a comic book. I wanted to create something transmedia—comic writers and artists discussing shared passions with creators from other fields. It would be an exploration of passion across format, and a way to attract new audiences from both sides of the divide. Are there die-hard punk fans who had never read an issue of Deadly Class? Or D&D lifers who were waiting to experience The Realm? Those were the questions I wanted to ask, but mainly, I wanted to create an interesting podcast about people making wonderful things from the same inspiration well. The series debuted with Rick Remender in conversation with Henry Rollins, followed by Jeremy Haun with Clint McElroy, Travis McElroy, and Carey Pietsch. I produced, recorded, and edited the entire series of Mirror/Image. Embeds of the first three episodes below. One of my long-form goals was to increase Image’s video output. Though SEO wasn’t my direct responsibility (that fell on Director of Digital Sales Chris Ross), YouTube is (often) ranked as the second largest search engine in the world, and an editorial strategy that prioritizes video is a good and logical editorial strategy. From my time at Paste, I realized that far more writers receive attention from journalists and the media because most journalists don’t have the language or education to discuss art. State of the Art was a new video series that featured artists providing voice-over while time-lapsed footage of them drawing played. As the goal was to increase video views via YouTube, I partnered with my old publication, Paste Magazine, which debuted each episode exclusively and could enjoy the traffic to its site. For State of the Art, I captured the drawings, shot the opening B-roll, captured/guided the voice-over, edited the audio, and produced the ensuing video. More video projects were in the works. A second video series called The Image Eye, which had a script and shoot date, would have provided news, interviews, and commentary, but unfortunately never substantiated. I’d also began producing and shooting mini-documentaries for prominent events and comics, starting with Saga’s return after a year hiatus. Select State of the Art videos below. 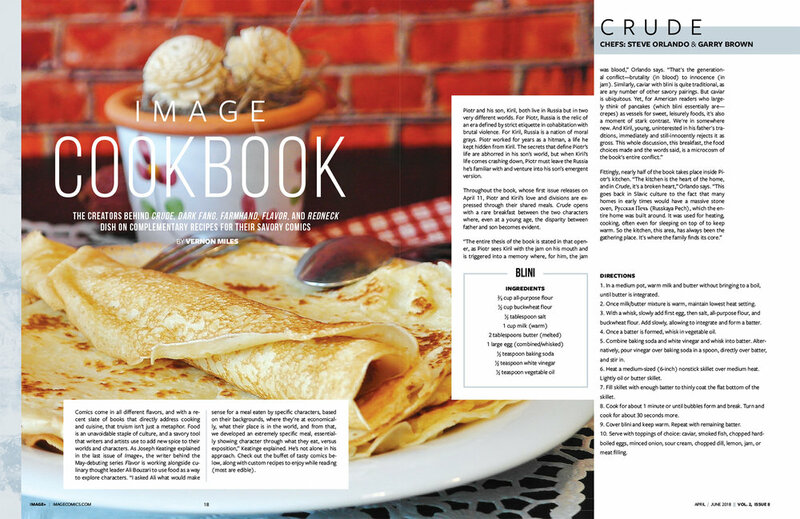 After the conclusion of Image+, publisher Eric Stephenson asked to include light editorial inside Previews, a catalogue that retailers use to order upcoming comic books and merchandise. I wrote and provided Q&As with the creative teams of upcoming comics, but I also wanted to offer content less common and more visually interesting. 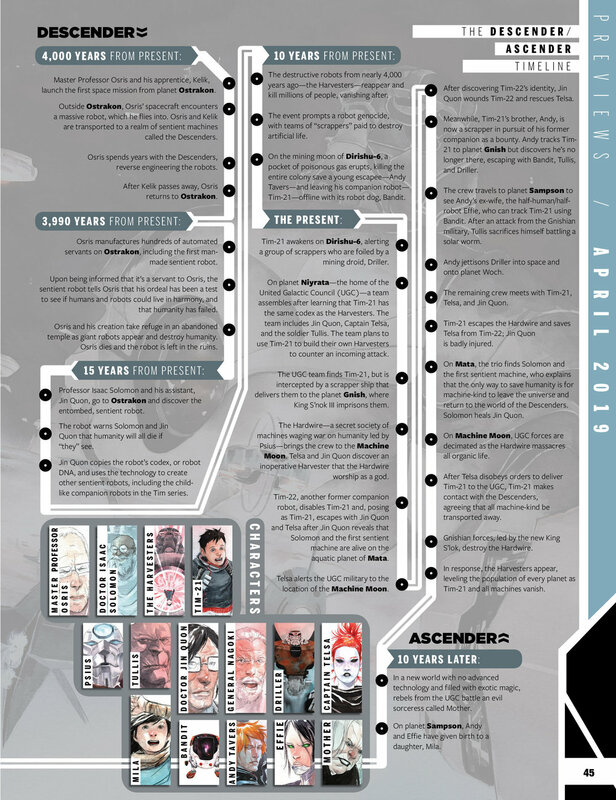 Alongside designer Sasha Head, I produced infographics mapping the in-fiction histories of comics including Descender by Jeff Lemire and Dustin Nguyen and East of West by Jonathan Hickman and Nick Dragotta.